Now that we've all had a good airing of grievances about elite colleges and their attendant injustices, let's get some perspective. Data from the Lumina Foundation show that among Americans aged 25-64, 52.4 percent have no more than a high-school diploma (though 15.4 percent of them attended college for a while). An additional 5.2 percent received a certificate of some kind, and 9.2 percent obtained an associate's degree. What most people think of when you say "college" is a four-year institution. Only 21.1 percent received bachelor's degrees, and another 12.2 percent also earned graduate degrees. Adding the last two categories brings the fraction of Americans with college or graduate degrees to just over one-third. While most of the conversation in the past week has focused on highly selective colleges such as Yale and Penn, it's important to remember that only a small number of America's colleges are selective. As FiveThirtyEight has reported, more than 75 percent of undergrads attend colleges that accept at least half of all applicants. The number who attend selective colleges - i.e., schools that accept 25 percent or fewer - is just 4 percent. And the number who attend schools in the very top tier, colleges that reject 90 percent or more, can be counted on your fingers and toes. You can probably guess most of them. (Though not all. On this U.S. News list, Pomona College came in at No. 11, and the Minerva Schools at Keck Graduate Institute came in first.) Less than 1 percent of college students attend these elite schools. Most students attend commuter schools, which tend to be community colleges. Even among those at four-year institutions, almost 25 percent attend part-time. Half of college students are also working, not getting plastered at frat parties. There's a healthy debate in policy circles about whether our current cultural preoccupation with college for all is a good thing. Some people who are funneled toward college might be a better fit for vocational training, apprenticeships, or other life paths; and while there is no doubt about the association between college completion and higher income, there is uncertainty about the causal relationship. Rather than gnash our collective teeth about whether Jason or Jessica can get into MIT, we might want to focus on all students, those who are headed for college and those who are not. Every student in elementary and high school should be learning about the "success sequence." The phrase was introduced by Isabel Sawhill and Ron Haskins of the Brookings Institution and has lately been reinforced with a study by W. Bradford Wilcox and Wendy Wang of the Institute for Family Studies. What they've found is that students have it within their power to virtually guarantee a middle- or upper-class income if they follow three steps. Those three basics are 1) finish high school, 2) get a full-time job, and 3) get married before having children. Young people who follow all three steps have only a 3 percent likelihood of living in poverty when they reach young adulthood. Eighty-six percent of Millennials who put marriage first had incomes in the middle or upper third, compared with 53 percent who had children before marriage. The success sequence works for those born into poverty, too. Seventy-one percent of Millennials who grew up in the bottom third of the income distribution were in the middle or upper third by young adulthood if they followed the three steps. Among African Americans, 76 percent who followed the success sequence achieved the middle class or above, and among Hispanics, the percentage was 81 percent. 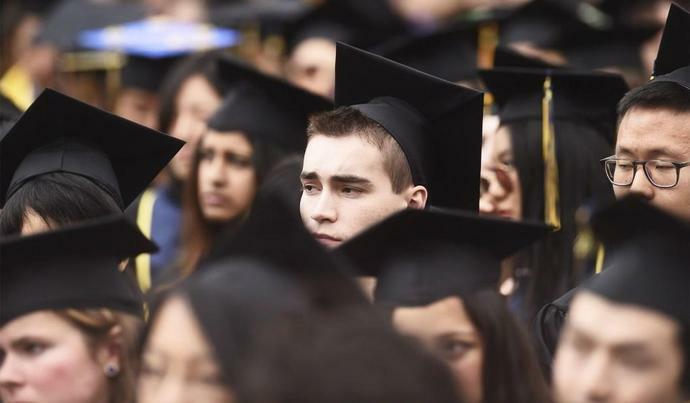 With all of the emphasis on a tiny sliver of the top 1 percent of students, most young people can get the impression that they are doomed to a lesser life. In fact, avoiding a few pitfalls like dropping out of high school, having a baby out of wedlock, and failing to find employment is a ticket to success. There's a bias among writer types to pay attention to Princeton and Columbia. But that's not really where the action is in helping most Americans.